Are you tired of feeling tired? Want to gain valuable insight into what affects your sleep quality so you can improve it? 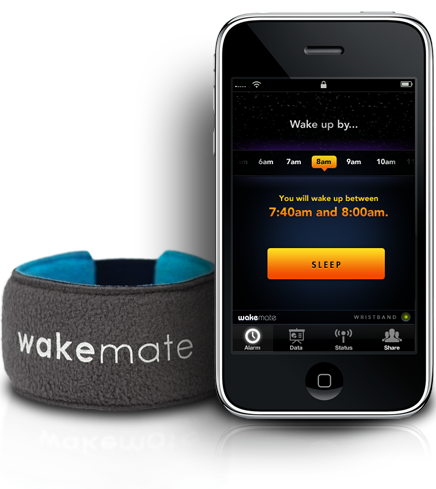 Sleep Scentsations wants to help you using an amazing sleep monitoring wrist band and the new Phone Application from WakeMate! 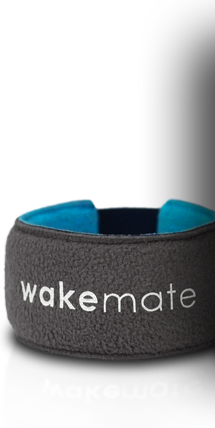 The WakeMate is a comfortable wristband that you wear when you sleep. It measures subtle body movements—a scientifically proven method of Actigraphy to map dips and peaks in your sleep cycle. Actigraphs are devices generally placed on the wrist (although they can also be placed on the ankle or trunk) to record movement. Collected data is downloaded to a computer (or in this case your phone!) for display and analysis of activity/ inactivity that in turn can be further analyzed to estimate wake/sleep. The latter technology is based on the observation that there is less movement during sleep and more movement during wake. The wristband communicates directly with your mobile phone to calculate the ideal wake time closest to your alarm setting. When you wake up, your night’s sleep data is automatically uploaded to Wakelytics™, their online analytics platform. The Wakelytics™ platform allows you to see a comprehensive overview and comparison of sleep quality scores, number of nightly awakenings, time before falling asleep, and more. The best part is that you can track anything you can think of using their Comparison Tool. This took allows you to see how different health, nutrition, and daily life activities affect your sleep so you can make better choices. Sleep Scentsations plans on using the Wakelytics Comparison Tool to test different methods like Aromatherapy to supplement sleep and to determine whether Sleep Scentsations Aromatherapy Pillow liners are scientifically beneficial as a treatment for better, longer sleep! Stay Tuned for the Results! FOR WHOLESALE INFORMATION ON SLEEP SCENTSATIONS AROMATHERAPY PILLOW LINERS CONTACT US AT DREAMSHOPLIVE@GMAIL.COM! Sleep Scentsations has added New and Improved Aromatherapy Scents! Sleep Scentsations has updated our website to offer a much more RELAXING Shopping Experience!! They’ve also added 4 New and Improved Scents to their line! An improved version of their favorite fresh fragrance! Relax and find your inner peace with the perfect aromatherapy blend of lavender and soothing chamomile that will help you enjoy a better nights sleep. Passions ignite with the warm , seductive essence of sandalwood, vanilla and honey. These scents are known as aphrodisiacs and might just help you get in the mood. A NEW fresh fragrance! Lift your spirits and recover from mental fatigue with a restful blend of rosemary and peppermint. An improved version of our popular selling White Tea and Lily Scent. This spa favorite will create a peaceful escape filled with the sweet scent of beautiful garden lily and white tea. A month’s supply of Sleep Scentsations (a box of 8 liners) is now only $15.99!! PLUS FREE SHIPPING! Sleep Scentsations will help you create a more relaxing sleep experience tonight. Our aromatherapy products will have you feeling more relaxed as soon as you rest your head on the pillow and breathe in the subtle aromatic blend of essential oil and fragrance. Start getting a better nights sleep now by choosing your favorite scent, simply place the Sleep Scentsations liner on your pillow and enjoy Pleasant Dreams!